PowerSlides from Macware is a collection of hundreds of backgrounds and templates for you to use to keep your work fresh. For £20, you get a single DVD that can install in either PowerPoint or Keynote. It takes a few minutes to get through the installer, but the process is relatively painless. The range of options is impressive, and anyone looking to extend their presentation possibilities without having to spend time designing their own slides, won't be disappointed. Though beauty is in the eye of the beholder, we can't really say the examples match the class and style of the Apple-designed templates you get with Keynote. That said, they're not poor or badly put together; just a touch less-polished than Apple's. The same goes for PowerPoint users too. 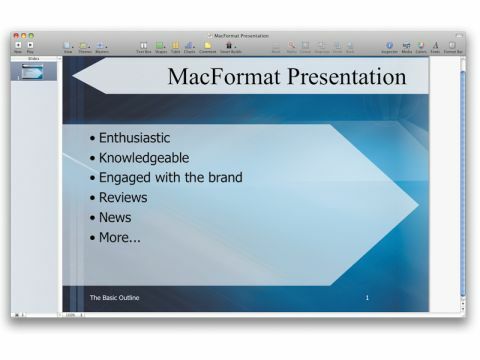 PowerSlides is good value for money and it opens new options to your presentation designs. However, you might find that you will have to do a bit more work to them yourself in order to bring them up to Apple levels of design flair.